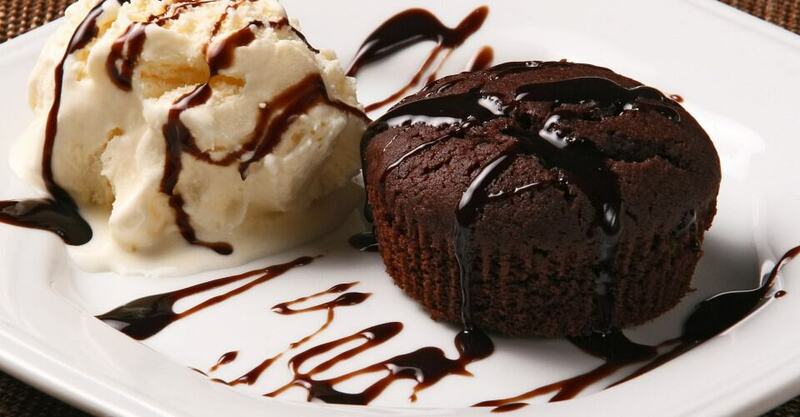 A typical 6-ounce brownie has about 600 calories. However many restaurants serve even larger brownies, 7 ounces or more (e.g., a 7-ounce caramel-pecan brownie from Boston Market has 900 calories). Plus, restaurants don’t stop with the basic square of chocolate fudge. A brownie #dessert is often the biggest treat on the menu, with everything but the kitchen sink thrown in: ice cream, whipped cream, chocolate syrup, pecans, chocolate chunks and a cherry on top. All this can add up to more than 1,200 calories. FIT TIP: To satisfy your desire for chocolate, try sugar-free pudding made with skim milk. Drop in a few chocolate chips while it’s hot or top it with light whipped cream. You can also make No Pudge Brownies, a fat-free brownie mix using yogurt (www.nopudge.com). If you’re out to dinner, ask the staff if any healthy desserts are available; some places have offerings in the 200- to 250-calorie range. For instance, Applebee’s has a chocolate raspberry layer cake that’s only 230 calories. Or if you must have the brownie, leave off some of the toppings. Plain cheesecake is your best bet at about 430 calories for about 4 ounces — you tend to eat less because it’s dense and rich. Don’t be fooled by the “carrot” in carrot cake — it isn’t just a slice of sweetened baby carrots. A 4-ounce portion has about 500 calories, but it varies depending on the amount frosting used. And what about poundcake? The name says it all — the original recipe calls for a pound each of butter, sugar, eggs and flour. That’s why it’s about 550 calories for 4 ounces. Plus, because poundcake is kind of plain, it’s often served with ice cream and/or a sauce on top, which adds another 250-400 calories. Believe it or not, other types of poundcake, such as banana bread, may actually be lower in calories (470 calories for 4 ounces) because the bananas replace some of the butter and sugar. FIT TIP: If you choose carrot cake, remove some or all of the cream-cheese frosting (over 100 calories per ounce). When dining out, look for low-carb cheesecake — Ruby Tuesday makes one. If you’re staying in, look for low-fat cheesecakes in your supermarket – they have 200 calories for a 3-ounce portion. If you decide to bake your own cheesecake, make sure to use low-fat or nonfat cream cheese as well as low-fat or nonfat cottage or ricotta cheese. You can also substitute Splenda for the sugar. Or if you have a craving for poundcake, try zucchini bread instead, which has about 360 calories for a 4- to 5-ounce portion depending on preparation. Because the main ingredient is zucchini, there is typically less “bread,” plus zucchini is a high-moisture vegetable, which allows you to use less oil in the preparation without sacrificing moistness (just add extra zucchini). They may both seem like blandly-colored strangely textured treats, but the calorie punch they pack is very different. Tiramisu is the clear loser here at 400 calories for 5 ounces. The primary ingredients are usually some mixture of creamy fats, processed sugars and alcohol. A typical recipe calls for eggs, mascarpone cheese, ladyfingers, cream, espresso coffee, liquor (e.g., brandy, Marsala or rum), sugar and cocoa or shaved chocolate. Tapioca, on the other hand, is essentially a root starch taken from the yucca plant (also called a cassava) and has only 120 calories for 4 ounces. It can also be used to thicken soups and sweeten baked goods. FIT TIP: A great option here is Jell-O Tapioca Fat-Free Pudding. Not only does this 100-calorie dessert let you indulge your sweet tooth without sabotaging your diet — it’s also divided into individual servings, so if you’re tempted to sneak a little more than one portion, all you have to do is stop when you hit the bottom of the cup. Strawberry shortcake (300-350 calories for 4 ounces), even though it’s made with heavy cream and sugar, is a bit better because, unlike its key lime counterpart (440 calories for 4.5 ounces), it doesn’t have a buttery crust or a processed, sugar-packed filling. FIT TIP: Go with plain angel food cake (which is fat-free and has only about 300–375 calories in 4 ounces) and add your own fresh or frozen berries and low-fat whipped cream. You can even make angel food cake (it’s already made with egg whites) with Splenda for even fewer calories. Or just enjoy half a cup of strawberries, which only adds up to 45 calories. Top the berries with a dollop of light whipped cream at 10 calories per tablespoon, and you’re getting a filling dessert for 55 calories. The two are about even, about 60–70 calories per ounce. So, with a typical home serving coming in at 4 ounces and a restaurant serving at 6 to 7 ounces, you’re looking at 240 to 490 calories. However, not all apple pies are created equal. For instance, there’s apple crumb pie or apple crisp, which add another 100 calories or so per serving. In fact, stay clear of anything with the word crumb in the name — it translates to additional calories (e.g., Starbuck’s Crumb Cake, 670 calories for a 6-ounce cake). FIT TIP: Skip the pie crust and save almost 100 calories. Or, if you’re craving something sweet at home, try baking your own apple pie and reducing the calories by using baking Splenda and a reduced-fat margarine or butter. Better yet, enjoy a baked apple: Take out the core, dab the apple with a bit of reduced-fat margarine and a tiny bit of brown sugar or Splenda, add some apple juice and cook for about 90 minutes at 350 degrees. Then top it with low-fat whipped cream and some chopped walnuts before serving. You can even bake apples in the microwave. Or try fresh apple slices and blueberries in Jell-O or frozen blueberries topped with low- or nonfat whipped cream. Also look for reduced-calorie frozen apple pies at the grocery — they’re great because they’re pre-portioned. When eating out, skip the whipped cream — it adds 80 to 100 calories per serving. And don’t say, “I’ll just scrape it off” — tell the server not to bring it out. Oh, and a scoop of vanilla ice cream to make it “a la mode” can tack on another 270 calories. OK, Baskin-Robbins’ Banana Split Sundae has 1,030 calories and is by far the worse of the two. But the Frappuccino, one of the highest calorie beverages Starbucks offers, also weighs in at 730 calories for 24 ounces. Train yourself to recognize desserts when you see them — even if they’re disguised as drinks and sold in a coffee shop. FIT TIP: If you need a cool caffeine jolt, opt for a regular iced coffee. Add skim milk and sugar (or Splenda) if you like it light and sweet. You can even throw it all in a blender and make your own Frappuccino. Just remember to skip the whip. If it’s ice cream you want, try some of the newer light ice creams. They’re tasty and you probably won’t even know the difference.